Over three days in mid July a bunch of us got together to walk the 52-mile boundary of the ancient Royal Forest of Dartmoor. 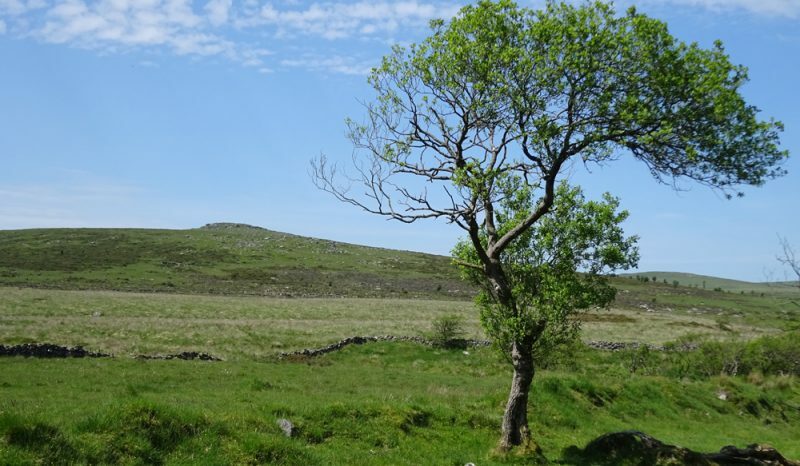 Different people took responsibility for recce-ing each day’s walk, sticking as far as possible to the ‘original’ route of AD1240 which was perambulated on the orders of Henry III (notwithstanding obstructions such as Fernworthy Reservoir which have appeared in the intervening years!) Day One was Cosdon to Dartmeet; Day Two Dartmeet to Princetown; Day Three Princetown to Cosdon. It was fantastically hot, with little breeze and not much shade (or cloud cover). We each carried at least 2.5 litres of water, and constantly dunked hats in streams and placed them, dripping, back on our heads. It was tough going – around 19 miles on the first day, and over 16 on the second. I had to drop out on the third due to boot (and therefore foot) problems, which I have since discovered was down to the extreme heat coupled with an unusually heavy rucksack. Disappointing, but sensible in the circumstances. 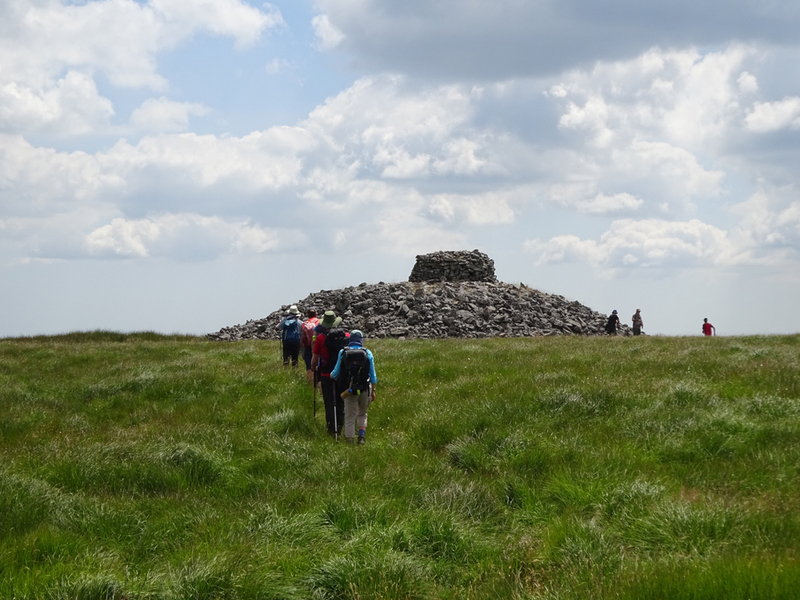 The photos below give a taster of the two days on which I walked (and if any of the captions are wrong I apologise – I did mean to take notes, but it was almost too hot to think!). 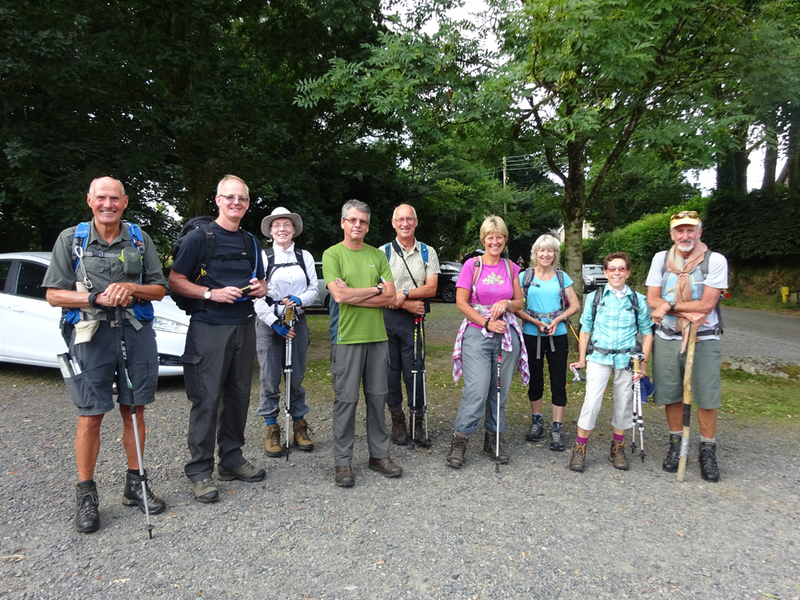 Many thanks are due to those who worked out our route so diligently (some going out several times to seek out hard-to-find boundary ‘markers’, many concealed under dense grass) – and congratulations to those who completed the course (I met them with ice creams in Belstone at the end of the last day and they were quite tired)! The group at Belstone at about 8am on the first day. 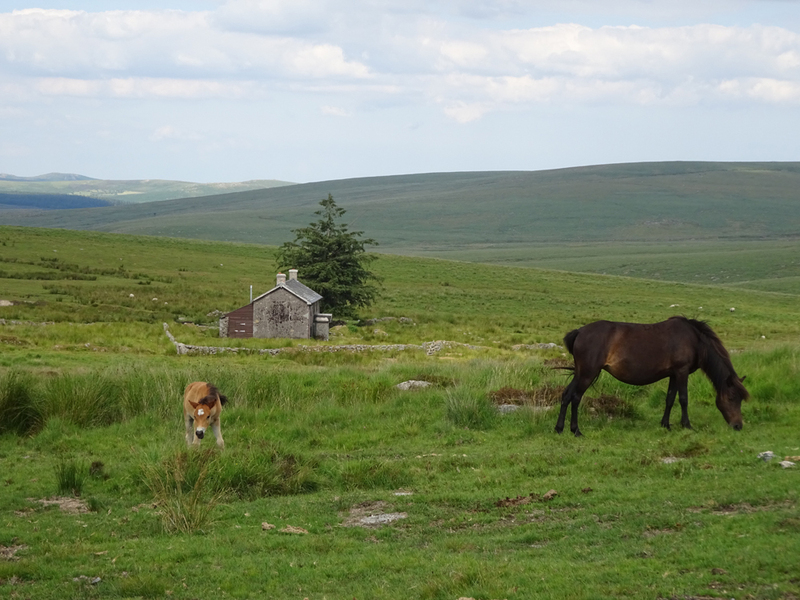 Somehow we managed to leave enough cars in the right places each day to enable us to get back to the bunkhouse at Powdermills each evening. 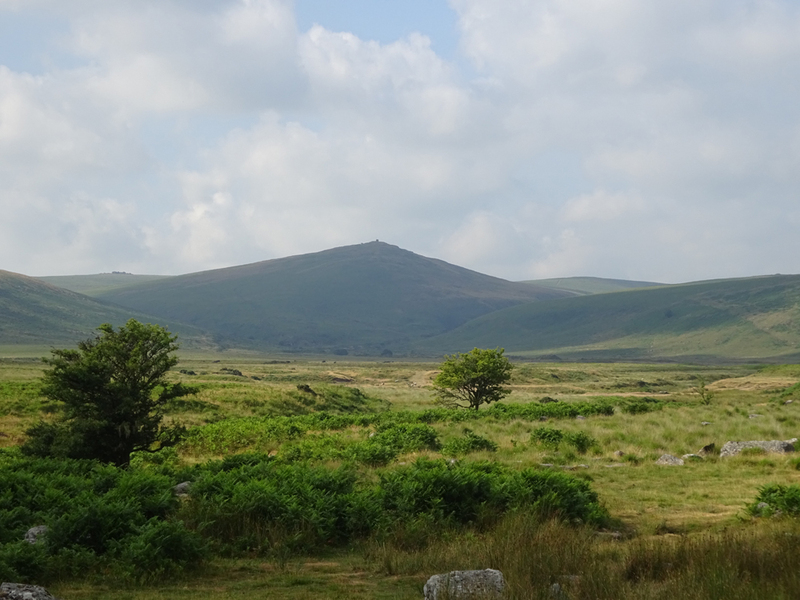 View across Taw Marsh towards Steeperton, before crossing the Taw and ascending to the top of Cosdon Hill (Hogam de Costdonne), from where we dropped down to Little Hound Tor, the Whitmoor Circle and the White Moor Stone. 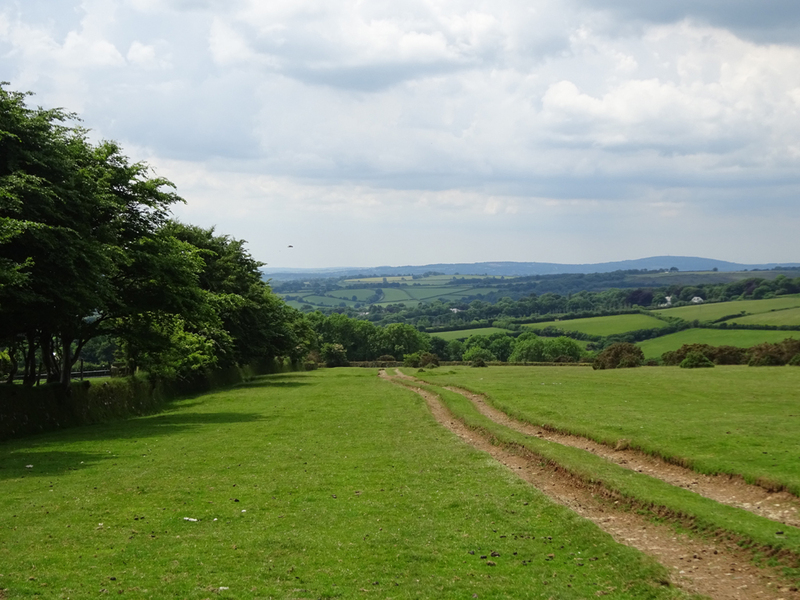 Then it was on to Ruelake Pit, where we hunted out a marker… then onto Rippator (Rival Tor) from where there is a fantastic view along the valley of the North Teign river, with Fernworthy Forest on the horizon. 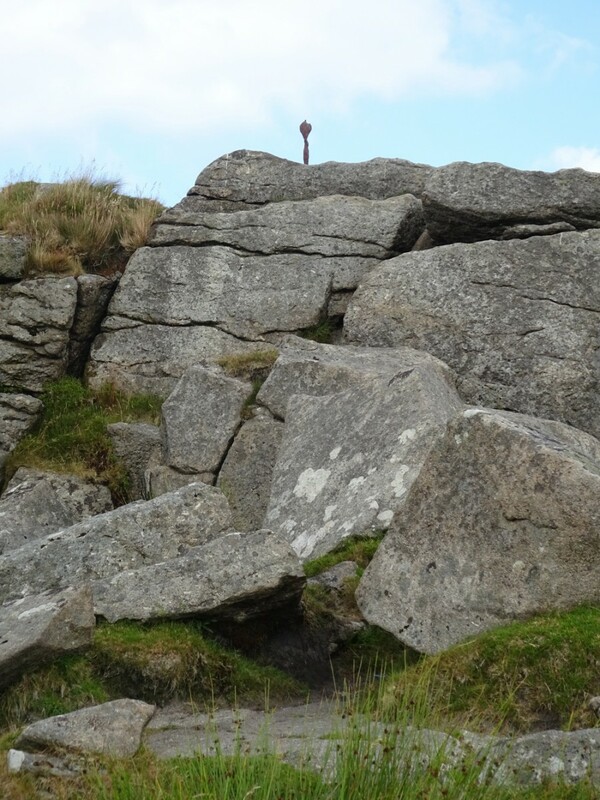 Next port of call was the Long Stone on Shovel Down, then over Thornworthy Tor and below the dam at Fernworthy Reservoir. 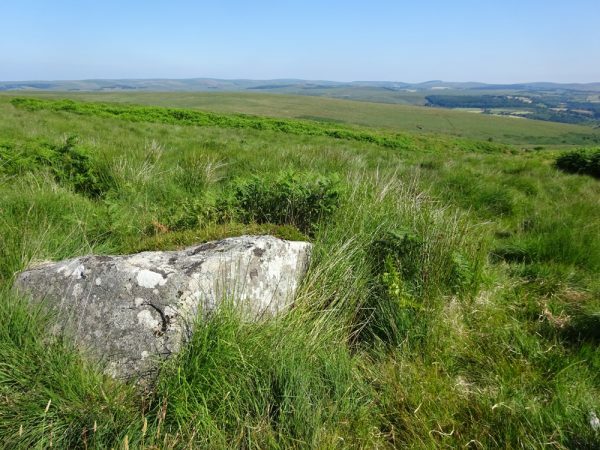 We walked over Chagford Common to the cairn on Water Hill (see header photo), then crossed the B3122 at King’s Oven (Furnem Regum). 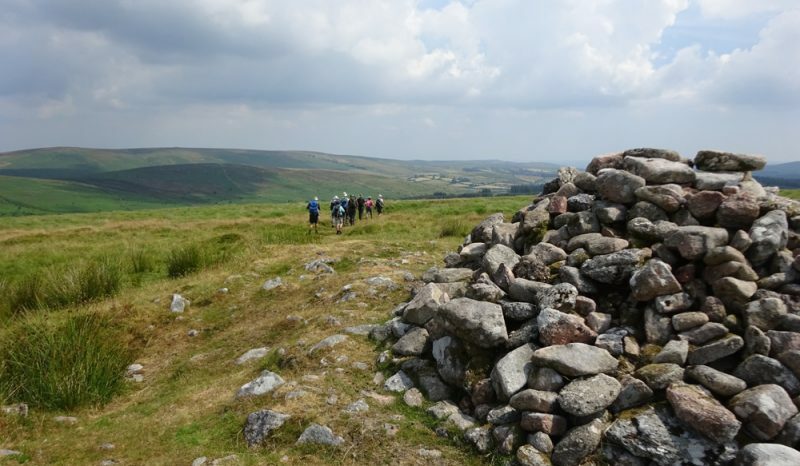 The next stretch was interesting, threading our way through the open workings below the Warren House, then following the western boundary of Soussons to pass Runnage Farm, and then the ancient tenement of Pizwell. 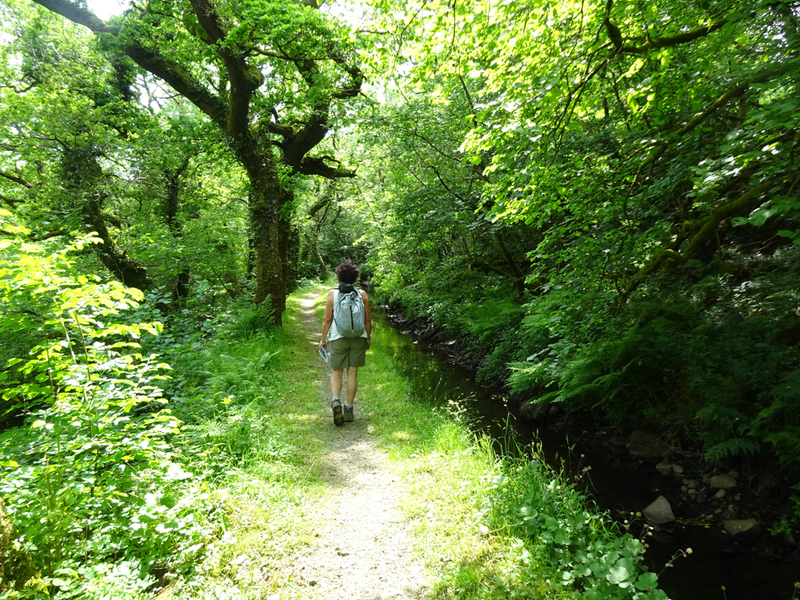 A lovely airy walk along Riddon Ridge came next, and then we followed the East Dart to Dartmeet (aliam Dertam). … while others were rather easier to locate (Petre’s Bound Stone on the top of Ryder’s Hill)! We headed around the slopes of Huntingon Warren and crossed the Avon via the clapper bridge (I managed to cool my feet in the river for 10 welcome minutes) before heading up to Eastern Whitebarrow (Estere Whyteburgh), the most southerly point on the Perambulation. From there we turned north and headed for ‘home’ (it’s a long way!). 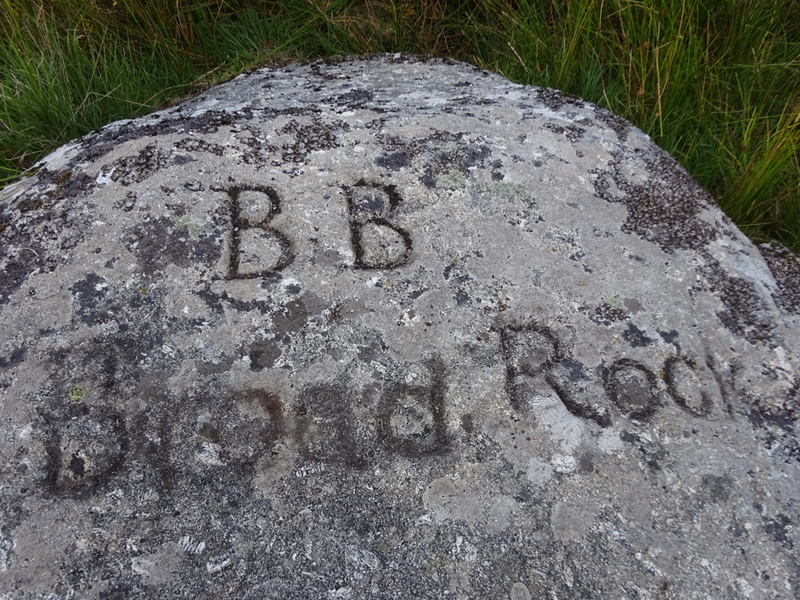 Crossways to Red Lake to Erme Pits, beyond which we found Broad Rock (not an original Perambulation boundary marker as far as I am aware) which kicked off a discussion as to whether such engravings on Dartmoor boulders should be preserved or allowed to gently fade into obscurity… this one is showing up well since someone had recently rubbed peat into the indentations. It’s a tricky one. 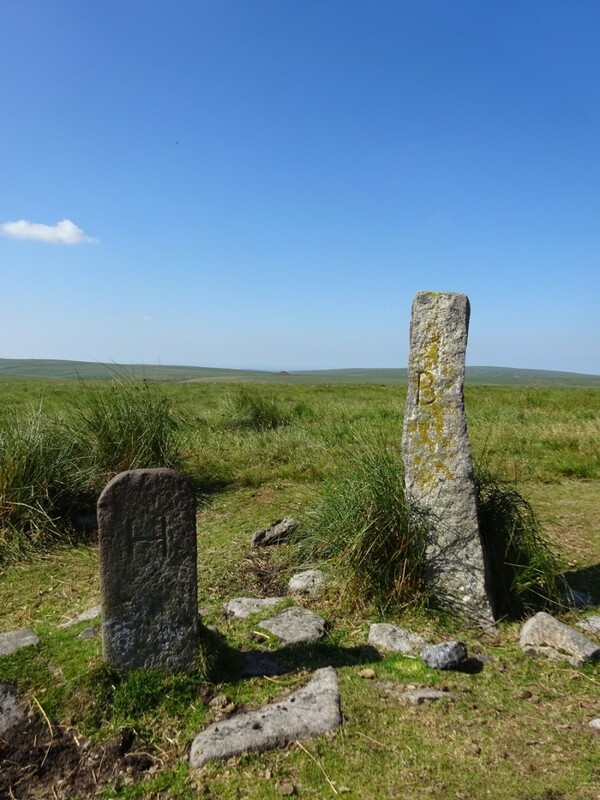 Next stop Plym Ford, then over the hill to Nun’s/Siward’s Cross. We spotted the cobra head boundary marker on South Hessary tor, then headed across the common to reach the B3212 (and transport) near Sailor’s Pond. So that was it for me, but I am determined to do the ‘last day’ soon! 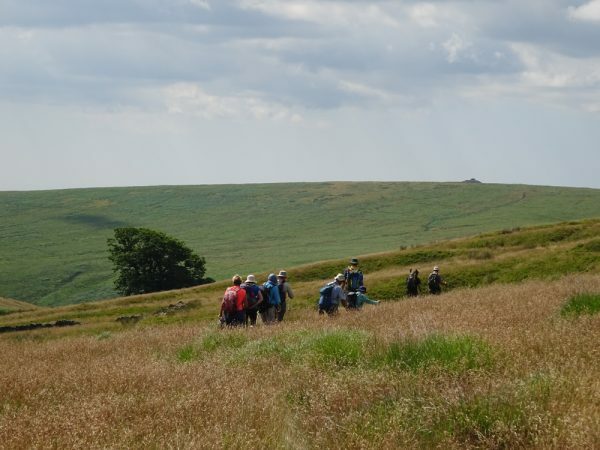 I’ve walked the Perambulation twice before, but never in such a detailed way and with so much work invested in working out the route beforehand. Once again a very big thank you to everyone who put so much into making it a fantastic experience. Post summer magazine recreation for the editor! Once the summer issue of Dartmoor Magazine is out of the way I can look to other tasks, and so I’ve just got stuck into some revision work for Crimson Publishing‘s Dartmoor Pathfinder Guide. 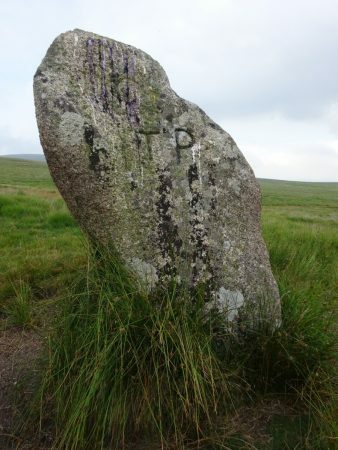 I’ve been working on all the southwest titles for several years, and researched and wrote PFG North & Mid Devon in 2011 (reprinted and amended in 2014 and 2017). 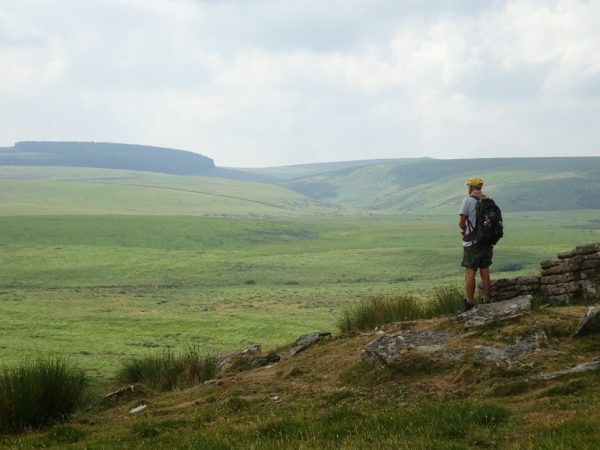 People often refer to the books as ‘those green books with OS maps’. The series has been around since the early 1990s, but have really stood the test of time. 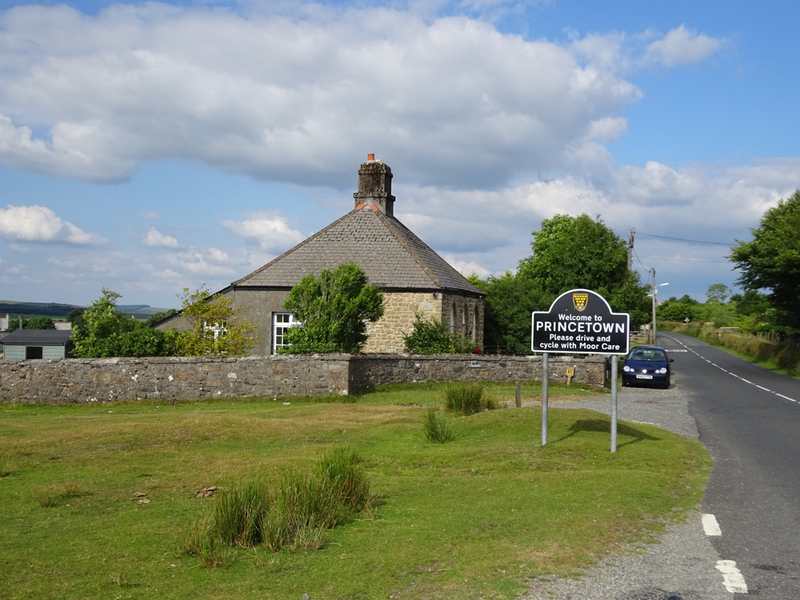 The decision behind which routes to check depends on what may have happened since the last update – in the case of PFG Dartmoor I wanted to alter the end section of one walk to avoid the now-very-fast stretch of road between the drive to Prince Hall Hotel and Two Bridges. 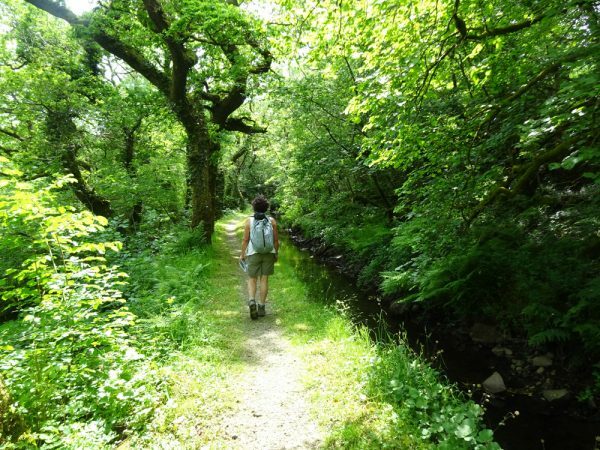 I checked out four circular routes: Lydford Gorge, Horrabridge (beautiful, but on a dull day), Mary Tavy and Two Bridges (photos from these two to follow). It’s highly enjoyable work – and always interesting to see what has changed in the intervening years. The Mary Tavy walk (c. 8 miles) starts from the church, and wends its way through fields and via tracks onto Horndon Down – which is where the views start! 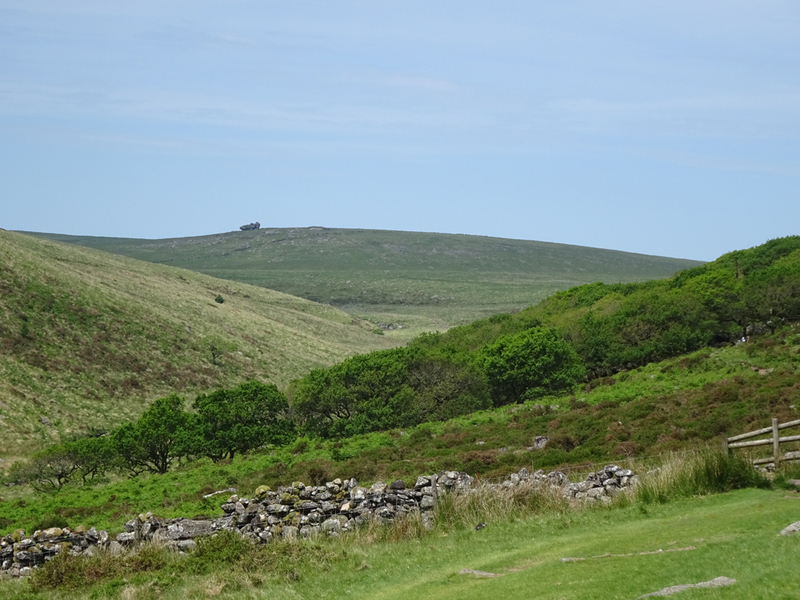 Once over the brow of the hill (this photo was take looking back along the route) you get great views towards Ger Tor, Hare Tor and Tavy Cleave. 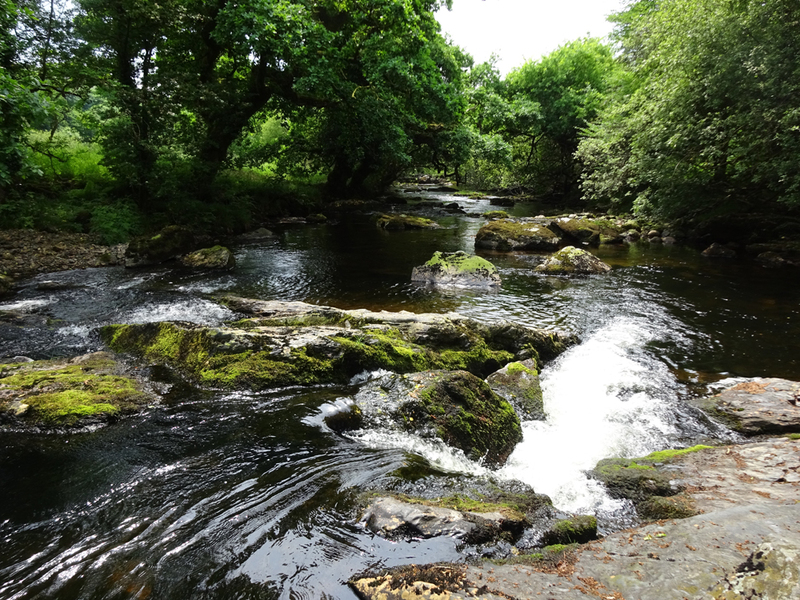 The way then drops down to Hill Bridge, where we stopped for a bit to eat (it was a hot and muggy day) by the cooling waters of the River Tavy. 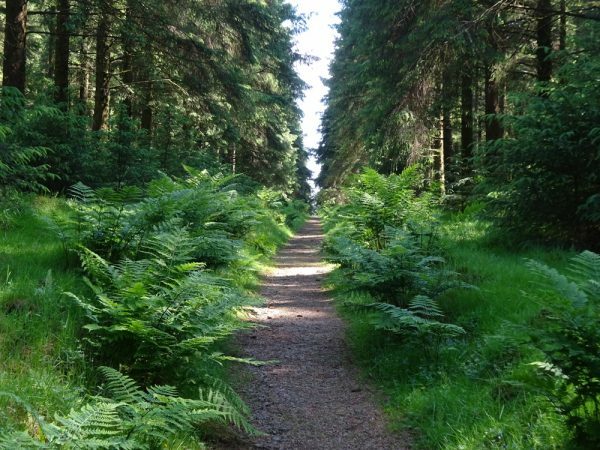 We followed the beautiful leatside path through Creason Wood (the leat feeds Bennett’s Reservoir) to reach Horndon Lane. 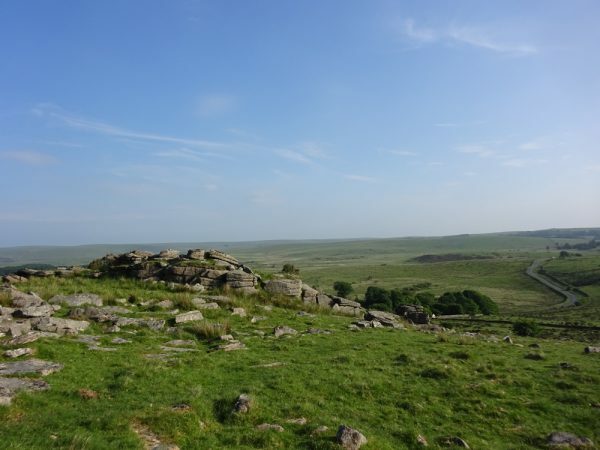 Then it was on to Cudlipptown, past Boulters Tor on Smeardon Down, and back to the start via Peter Tavy and a crossing of the Tavy river. It’s a wonderful walk (Walk 22 in the book). 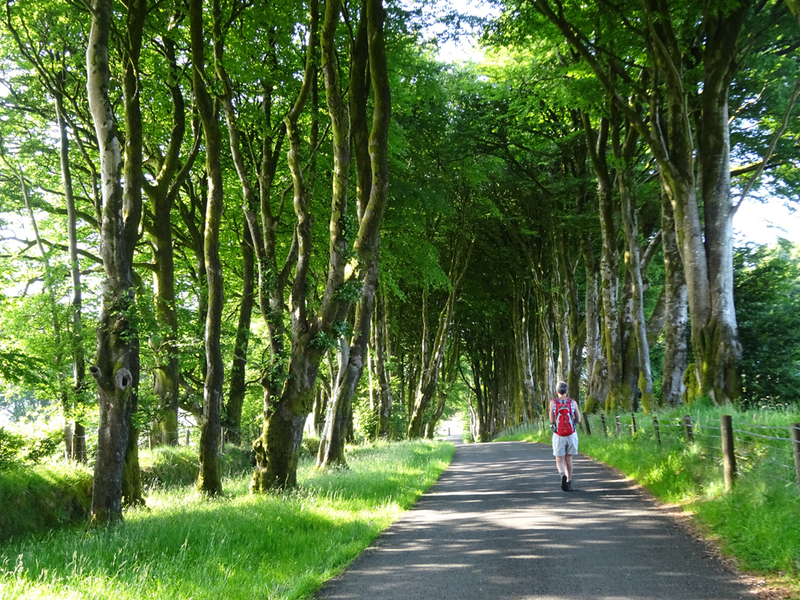 Yesterday a friend and I tackled Walk 25 – 9 miles in the book, but they always end up longer for some reason – and this one needed to be extended at the end anyway – we ended up walking 12 miles in great heat! It was the most beautiful afternoon. We started from Two Bridges, and headed up the West Dart valley towards Wistmans Wood. We crossed the ridge to the east of the river by Longaford Tor, then skirted the old gunpowder factory and associated buildings at Powdermills (header image). 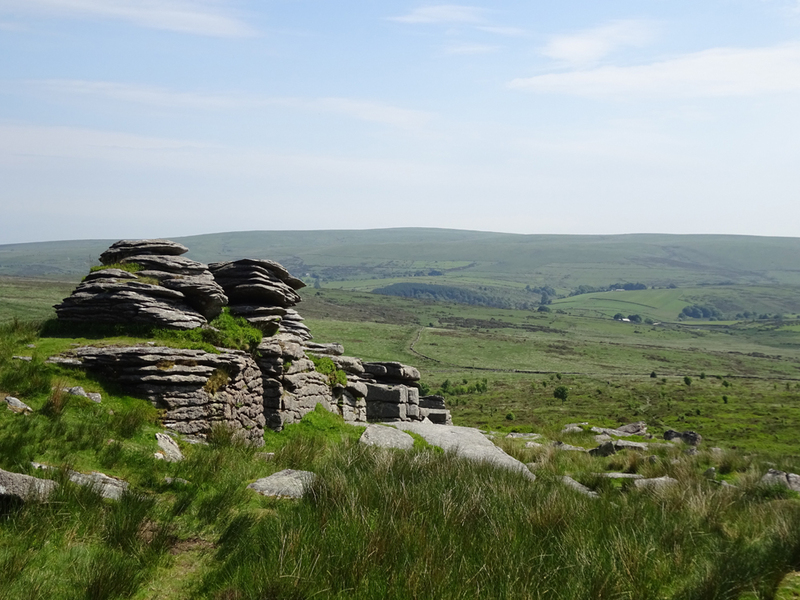 A bit of welcome relief from the hot sun came as we walked through Bellever Plantation before ‘up and over’ Bellever Tor. 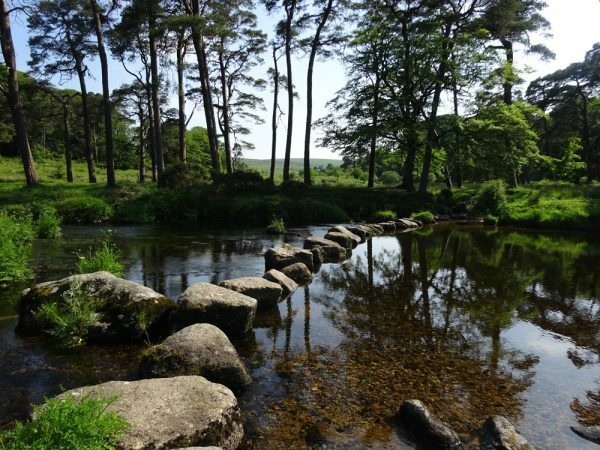 Next stop Dunnabridge, and down to cross the West Dart via the blocky stepping stones near the junction with the Swincombe river. 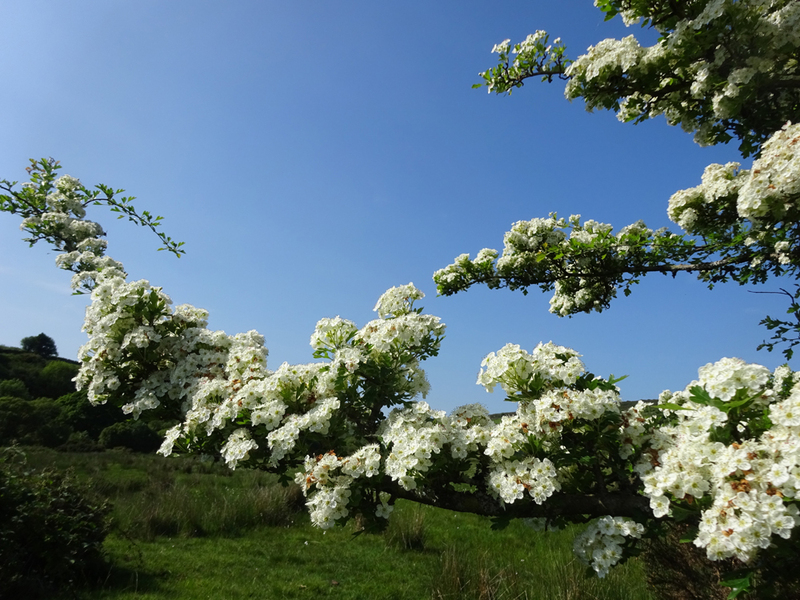 Nearby we found the most beautiful hawthorn tree, smothered with blossom. 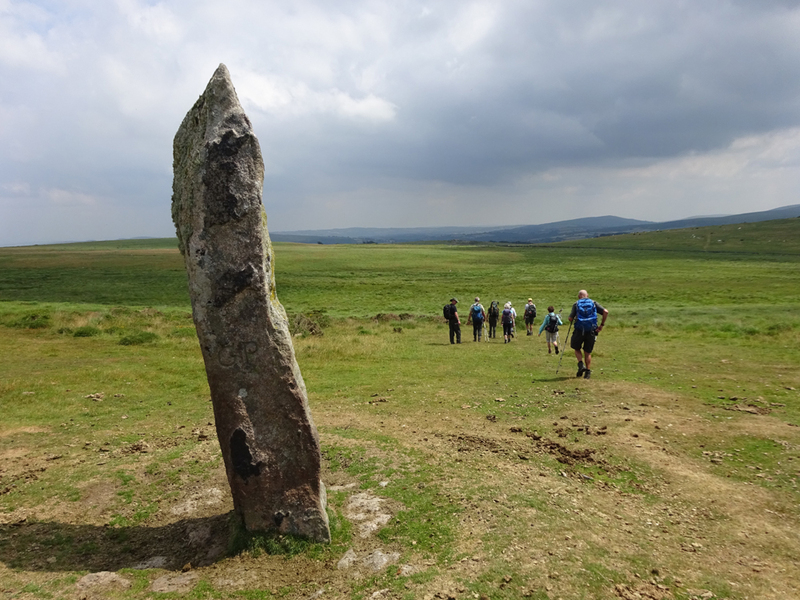 On we went across the Swincombe, through the farm at Sherberton and over the common to cross the West Dart again. Then it was up the amazing beech-lined drive that leads to Prince Hall Hotel and the Dartmoor Training Centre. On reaching the B3357 we turned right, then crossed the road and headed up the bridleway across Muddilake (not very after all this dry weather!). 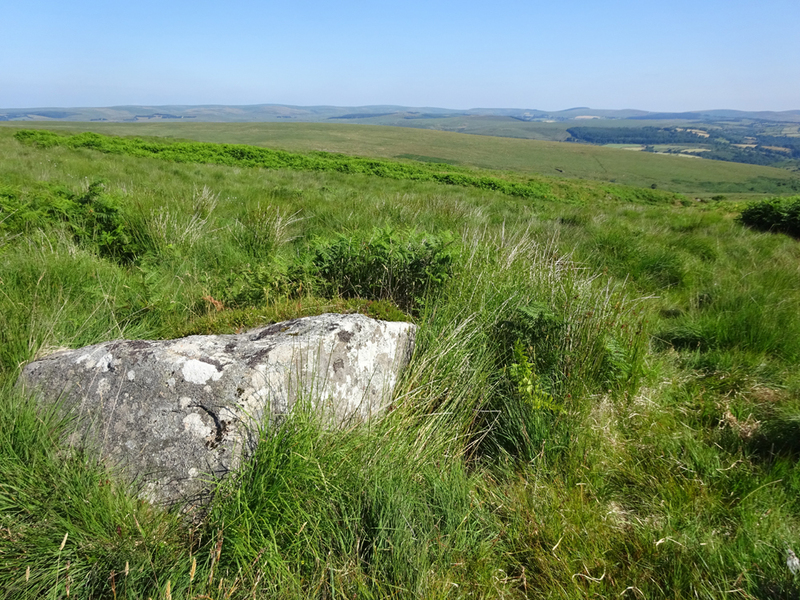 We crossed the B3212 near Cherrybrook Hotel, then skirted the field wall… through a gate, then headed for Crockern Tor. 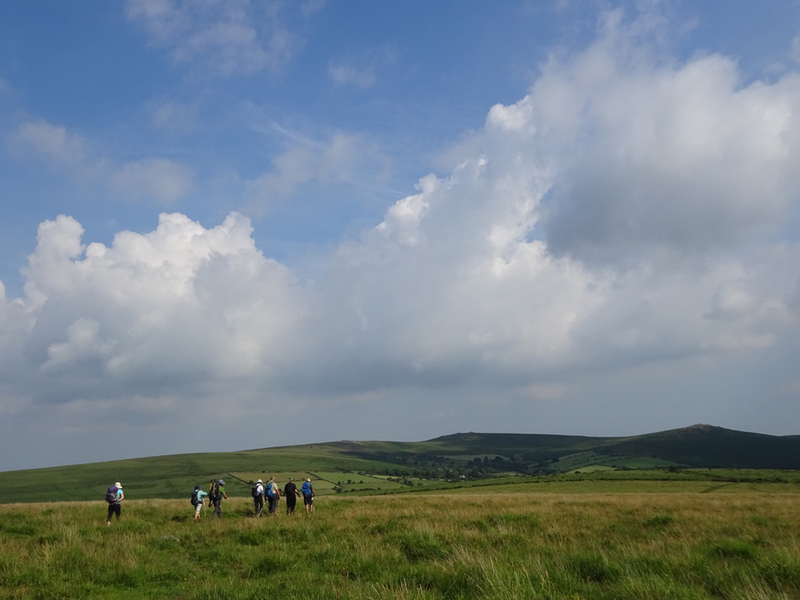 From there it was easy to drop back to the outward path and return to the car park at Two Bridges. I’m pleased to say that the amended finish worked really well (I only hope that the publisher likes it too). 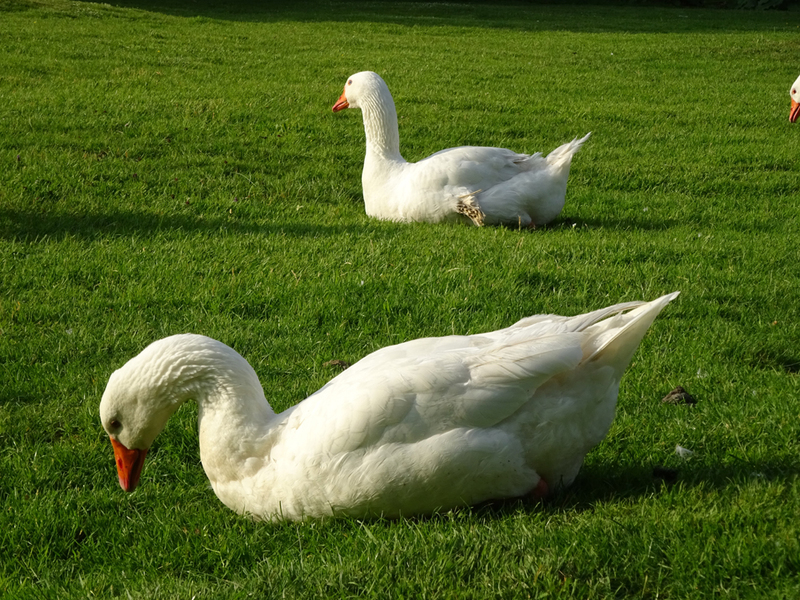 We ended up having a refreshing drink in the garden at the Two Bridges Hotel… in the company of those famous geese, looking remarkably relaxed in the evening sunshine!